tra Medical Centre started as a 24-hours 20 bedded maternity and Polyclinic operating from a double storey bungalow house at Jalan Lumpur in Alor Star under the name of Pusat Lim & Yu. The centre was the brainchild of Dr Lim Kim Huat and Dr Yu Ching Hsiu..
Putra Medical Centre was registered on 19th April 1991 primarily to participate in the growth of private hospitals in Malaysia and commenced operation on 2nd July 1995. The centre started with only a handful ofSpecialists and 3 Medical Officers. Today the centre has a team of 19 Residents Consultants, 9 visiting Consultants and 5 Medical Officers and a host of locums to support the Polyclinic. Putra Medical Centre has now grown into a 143 bedded, acute care & general medical/surgical hospital. 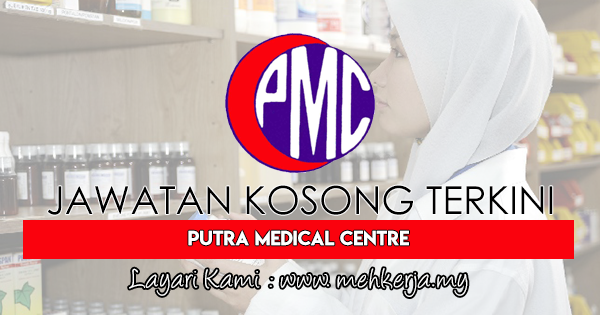 0 Response to "Jawatan Kosong Terkini di Putra Medical Centre (PMC) - 7 Februari 2018"